The PermaDesign Weblog, with Nate Downey and Melissa McDonald! 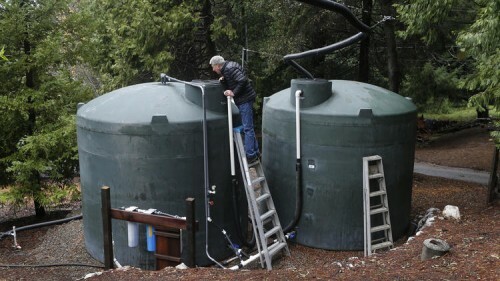 There is an interesting article in the Los Angeles Times this week regarding rainwater harvesting. In California, property improvements such as solar capture systems, fire sprinklers, and access for the disabled are not classified as new construction under state law. This incentivizes people to build without an increase in property taxes. Sen. Steve Glazer is proposing that rainwater harvesting systems be placed in the same category. If you look at California weather related event in particular over the past year it is easy to see why water storage makes so much sense and can save money in the long run. Next week in Albuquerque the conference will be held at the Embassy Suites Hotel. The event takes place November 15-17. Hear from a more than 30 speakers and a wide range of topics from ranching, farming, conservation, community, and of course all things soil. 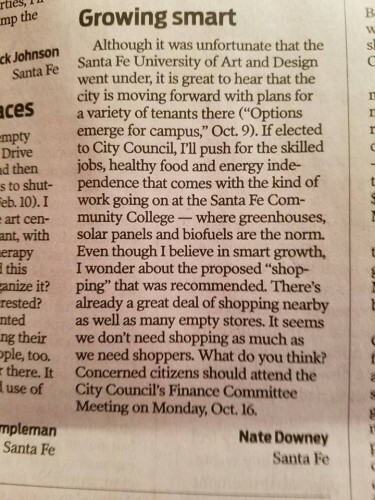 Happy to see my letter in the Sunday paper--BUT shocked that its most important sentence was deleted! After the parentheses in the attached, please insert "Low-income housing topped the list of the city’s priorities, and that’s even better." The deletion alters the letter's main point which is HOUSING SHOULD BE OUR FIRST PRIORITY on the city-owned campus. Better jobs, live-work zoning, year-round food production, and alternative energy should also be incorporated into the 63-acre parcel (as well as the surrounding area), and we should also maintain a strong educational component there, but our top priority is clear. Here's my October column in The Santa Fe New Mexican.... Another thing you can do with tomatoes is throw them at me (and see if I catch them in my mouth). Looking forward to being interviewed on another radio show. This time it’s Living on the Edge with Xubi Wilson and David Bacon today at 4:30pm. Please tune in! We’ll be discussing the upcoming Economics of Happiness conference in Santa Fe (October 12-14), my Journey Santa Fe talk at Collected Works Bookstore (October 8, 11am), and last night’s luscious rain. My September column touts a local conference (Oct 12-14) featuring Winona LaDuke, Judy Wicks, Charles Eisenstein, Vicki Pozzebon, Elaine Sullivan, Emigdio Ballon, R. Charlie Shultz, Paul Gibson, Don Bustos, Luke Spangenberg, Marian Naranjo, Nicholas Mang, and Alan Webber. I'm honored to be on the docket, too. BONUS! --> I'll be speaking about the conference at Collected Works Bookstore on Sunday, Oct 8, during a Journeys Santa Fe event starting at 11am. Please join me! Come have your voice heard during a joint session of the EPA and the City of Santa Fe. 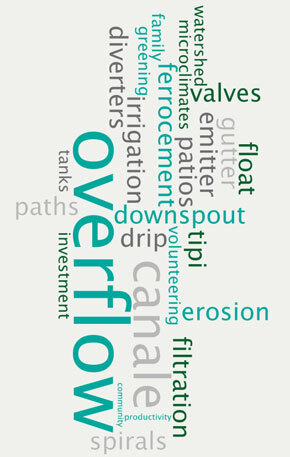 The discussion will focus on how to manage the valuable yet destructive resource of stormwater within the city. Tell your neighbors and friends! I'm looking forward to being interviewed at 2pm today by Richard Eeds. Please tune in to 1260AM, 101.5FM, or stream it live at http://www.santafe.com We.9;ll be discussing my Journey Santa Fe talk (10/8) with Ann Filemyr at Collected Works Bookstore, the upcoming Economics of Happiness conference (10/12 - 10/14) in Santa Fe (with Winona LaDuck, Judy Wicks, Charles Eisenstein, etc. ), and more. Looking up and south at the neighbor’s house. 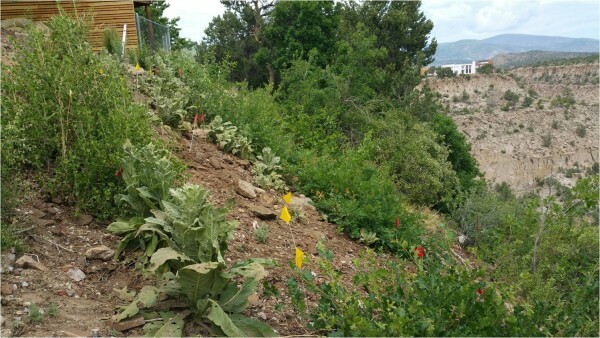 Fortunately, volunteer plants were already at work when we arrived to start the installation! Here flags have been placed to indicate future tessellations. 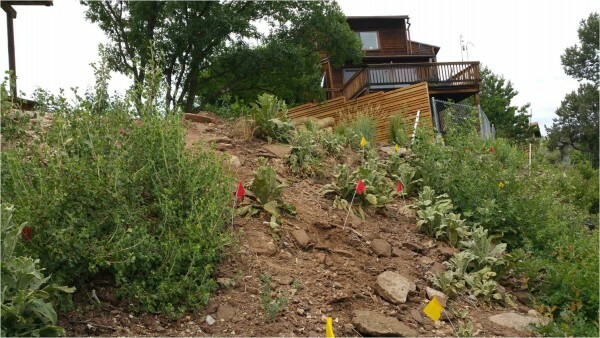 The yellow flags indicated one form of tessellated mini-swale made out of straw “books,” the 2” to 4” wide “flakes,” or sections, of a straw bale. The red flags indicated locations for a straw wattle.